The NVRS Tactical line of night vision riflescopes are accessory driven and utilize dual Weaver rails for self-customization. Mix and match accessories to meet your specific needs. In addition, the Yukon Certified Image Tubes are hand picked by Yukon representatives to make sure the absolute best quality tubes are used. This makes the NVRS Tactical units perfect for law enforcement, military and professional use. The NVRS 3x50 Tactical Gen 2+ may look like the NVRS 3x50 Tactical Gen 1, but that is where the similarities end. 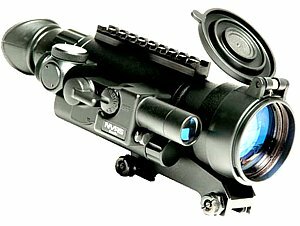 The NVRS 3x50 Tactical Gen 2+ provides an amazing amount of clarity and performance. It is the best value for the cost. The unit's 50mm objective lens is one of the largest objective lens in use and provides outstanding light-gathering capabilities. The NVRS 3x50 Tactical's premium Gen 2+ image intensifier tube makes all the difference, resulting in a higher performance. Generation 2+ night vision units have shown major improvements in image resolution and general performance and are considerably more reliable. The biggest gain in Generation 2 is the ability to see in extremely low light conditions, such as a moonless night, without the use of an infrared (IR) illuminator. The Gen 2+ image tube works well with low to no light, but Yukon's exclusive built-in PULSE Infrared (IR) Illuminator with a range of 100 m extends the NVRS' viewing range. The PULSE system utilizes quick infrared energy bursts that pierce the darkness further to increase distance, visibility and image quality. The PULSE IR System provides the highest level of infrared illumination without significant battery drainage. The same “pulsing” frequency that is invisible to human eyes infiltrates longer distances due to the Infrared Illuminator's quick energy bursts. The unit is powered by two AA batteries and is turned on by a flip of a switch. The unit can also be turned on by using the NVRS's wireless remote on-off switch, which can be easily placed on your rifle or any other place nearby for easy access. This makes it possible to activate the scope without removing your hands from the rifle. Even the rubber eye shade has been well thought out. Its oblique shape provides comfortable viewing and it provides an excellent shield - it keeps the night vision unit's green glow hidden from animals and observers. The 45 mm eye relief provides protection during a rifle's recoil and even more comfort for those that wear eye glasses. The NVRS Titanium 2.5x42 Gen 2+ riflescope is designed with ruggedness, durability and the user's ease in mind. Its ergonomically-designed body is a hunter's best friend. All switches are designed to be easily used while wearing gloves and to reduce hand cramps. The unit is mounted to a rifle's Weaver base by a Weaver mount and comes with a quick release mount for easy release. The NVRS 3x50 Tactical Gen 2+comes with an “on-rifle” carrying case, so don't worry about removing the unit at the end of a day of hunting; the carrying case fits around the unit as it stays attached to the rifle.